Furnace ants Melophorus carrying a dead earwig back to the colony. Despite the size range visible in the photo, all represent a single species. Photographed by Alex Wild. If there is one group of organisms that you are guaranteed to see anywhere you go in Australia, it is ants. 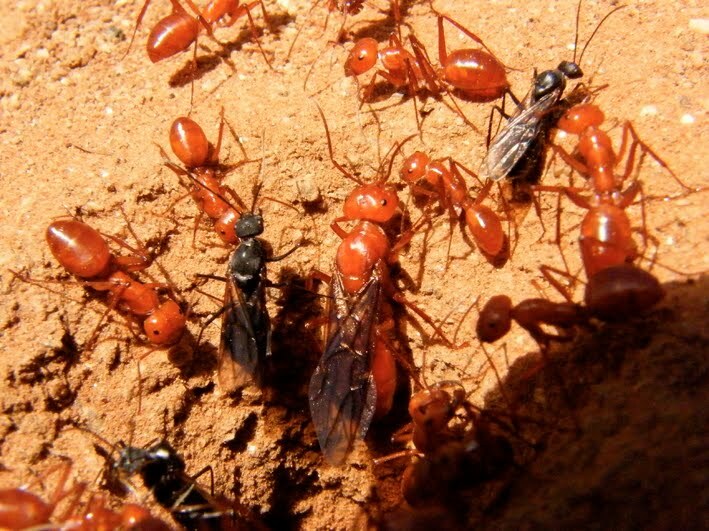 Especially in the inland arid parts of the country, ants are generally the most prominent insects to remain active and visible during the daylight hours, and they are perhaps the best-studied group of Australian insects (mind you, I work in a lab inhabited primarily by ant specialists, so my impression may be biased). Melophorus, the subject of today's post, is a genus of ants unique to Australia. It is a member of the Formicinae, the clade of ants distinguished by the production of formic acid through an acidopore at the end of the abdomen, and its species are distinguished from related genera by their slit-shaped propodeal spiracle, metapleural gland and antennae inserted close to the posterior margin of the clypeus. About thirty species have been described to date, but this number is undoubtedly low: for instance, of the 30+ morphospecies identified from the south-west corner of Western Australia, only about a quarter represent named species (Heterick 2009). Estimates of species numbers are complicated by the fact that most, if not all, Melophorus species are polymorphic, though variation is continuous rather than into discrete castes. Emerging young queen (the large red winged individual) and males (smaller, black) of Melophorus bagoti, from Ken Cheng. The highest diversity of Melophorus species is found in arid environments, where they forage during the daytime. The best-studied species, the Australian honeypot ant Melophorus bagoti, has the highest recorded heat tolerance of any ant, and forages in air temperatures above 50°C, with ground temperatures in excess of 70°C (Christian & Morton 1992). Foragers of M. bagoti mostly collect the carcasses of dead insects that have expired in the heat, though they will also collect plant material such as seeds and liquid foods such as nectar (other Melophorus species may focus on the latter food supplies). Despite their high heat tolerance, the M. bagoti workers are working on the knife-edge: about one-fifth of a colony's foragers will die each day in these punishing conditions, and the average life expectancy for a forager is only about five days (Muser et al. 2005). Indeed, Muser et al. (2005) estimated that the average forager only makes one successful food collection during its working life, and suggested that the bulk of a colony's food supply was derived from a relatively small core of foragers that managed to beat the odds (the longest forager career they recorded was at least 27 days). Repletes of Melophorus hanging from a colony ceiling, photographed by Sarah Tahourdin. Melophorus bagoti is known as the honeypot ant* because, in addition to the normal workers, the colony is home to specialised workers called repletes. The repletes do not leave the colony to forage; in fact, they probably barely move at all. Foragers collecting liquid food will, upon returning to the colony, pass their collections on to a replete. The replete's abdomen swells enormously as it fills with food, transforming the replete into a living food store, ready to pass its cache back to hungry workers that approach it for feeding. 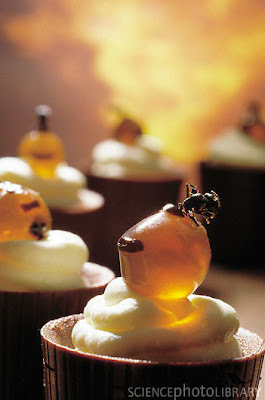 Needless to say, honeypot repletes are also of interest to predators, including humans, who are quite happy to take advantage of these sweet pre-packaged morsels when they find them. *Melophorus species as a whole have been called 'furnace ants' due to their high heat tolerance. Repletes, frozen and used to add flair to desserts. Photograph by Peter Menzel. 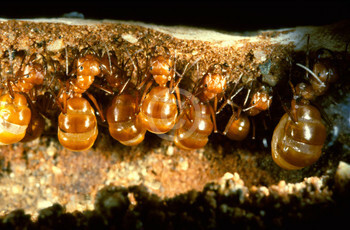 It has been suggested that Melophorus species became specialists in high temperatures as this avoided competition with the Iridomyrmex meat ants that dominate the Australian daytime ant fauna. Iridomyrmex species are large and aggressive, and effectively exclude most other species from competing with them. However, a small number of Melophorus species not only do not seem to avoid Iridomyrmex, but actually seek out their company. Melophorus anderseni mingles with workers of Iridomyrmex sanguineus entering and exiting their nest, from which it steals larvae and carries them back to its own nest, located alongside the Iridomyrmex nest but having smaller entrances that the large Iridomyrmex cannot enter. 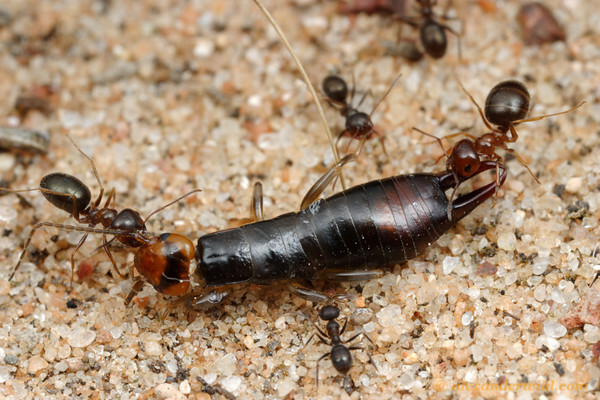 Melophorus anderseni workers are apparently able to avoid detection by the Iridomyrmex as they rub against them to pick up the meat ant's scent. Though the Iridomyrmex have not been observed taking action agains the Melophorus themselves, they have been observed using pebbles to block off the entrances to the Melophorus nest (Agosti 1997). Agosti, D. 1997. Two new enigmatic Melophorus species (Hymenoptera: Formicidae) from Australia. Journal of the New York Entomological Society 105 (3-4): 161-169. Christian, K. A., & S. R. Morton. 1992. Extreme thermophilia in a central Australian ant, Melophorus bagoti. Physiological Zoology 65 (5): 885-905. Heterick, B. E. 2009. A guide to the ants of south-western Australia. Records of the Western Australian Museum Supplement 76: 1-206. Muser, B., S. Sommer, H. Wolf & R. Wehner. 2005. Foraging ecology of the thermophilic Australian desert ant, Melophorus bagoti. Australian Journal of Zoology 53: 301-311.